The Elephant Age is the average age that children outside of the system are doing the same mathematics as your student. We calculate this by the averages provided by early age education research and by curriculum standards set by federal and state governments for grade levels. We recalculate the Elephant Age every time a student passes a milestone. 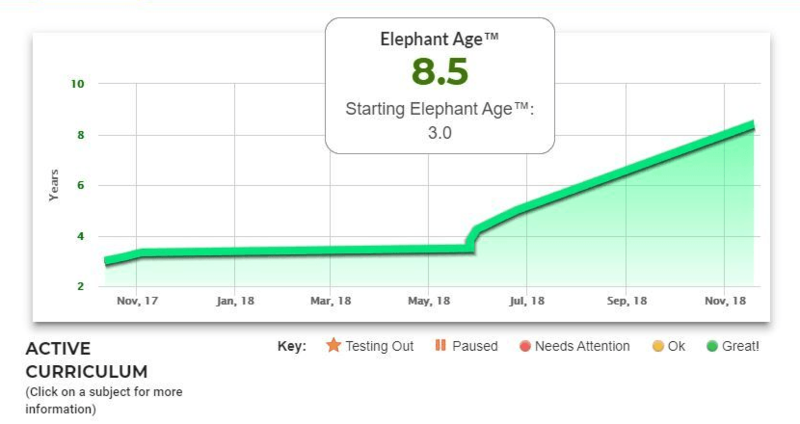 The Elephant Age graph on the dashboard is also updated by milestone passes. If your student has a lot of subjects open, it can slow progress on the Elephant Age. The reason for this is that the games choose questions from the open subjects at random and if there are a lot of subjects open this can inhibit the ability to close milestones. An unknown feature of the games is that the student may choose the subject of the next question. You will notice that there is a yellow highlight around one of the subjects, indicating the current question is from that subject. If your student taps or clicks on one of the subjects, the background will highlight, and that indicates the next question will come from that subject. If the student focuses on several subjects at a time, overriding the random choice, they will pass milestones faster causing the graph and age to update.